I do love sweeping historical sagas and while I wasn't expecting that with this book, that's what I got, as it covers about 80 years. Malka is a little girl (about 5) when her family decides to emigrate from Russia to South Africa. While her mother and sisters are quarantined with an illness, her father talks Malka into going to America instead, and she lets him have the money sewn into the armpit of her coat. Her mother never forgives her. In the East Village tenements of the first decade of 1900, her family barely scrapes by. While Malka and Flora, her next-youngest sister, dance and sing for pennies to contribute to the household, Malka is run over by a horse, permanently disabling her. 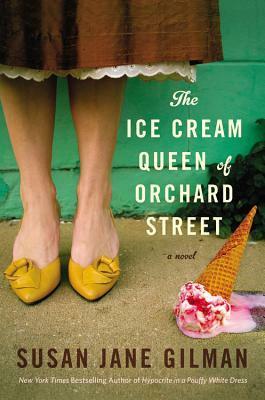 The Italian ices peddler responsible takes Malka in and there, she finds her future: ice cream. The story is being told to us by a much-older Malka (now Lillian) in the 1980s as she is on trial for some horrible incident that happened to a child on Lillian's TV show, so obviously, we know she's come to great success at some point, but still has some personal problems. Most of the story is flashbacks but occasionally we are treated to the "now" storyline where she spends time with her punk grandson in her fancy but empty house, reminiscing on how she got to where she is from her less-than-humble beginnings. Her voice is very distinctive and while she could be an unreliable narrator, you get the feeling that she is so hard on herself that if anything, she might be making a lot of things out to be worse than they are, such as how ugly she thinks she is and how horrifying her disability is to others. With a mother who never loved her and a family who abandoned her when she was hurt, it's easy to see why she'd have a pretty low self-image. I don't want to get into more but it really is a rags-to-riches story covering 1900-1980 and is quite entertaining. My book club read this and it was quite a juicy read, with lots to discuss. Some of the Northerners told their own stories of going to Carvel as children (the inspiration behind the story although apparently the Carvel family and other ice cream families were rather nice and didn't have any personal dirt.) I was intrigued by the opening of Long Island beaches and coasts to Manhattanites in the 1930s which I knew was due to Robert Moses, as I read his biography a couple of years ago. Other members talked about how the story of the immigrant really spoke to them; everyone seemed to have something salient to grab onto and identify with. While the author said she was trying to create an unlikable character in Malka/Lillian a la Scarlett O'Hara, I liked her. (I also like Scarlett O'Hara and also Jane Austen's Emma who was also created to be unlikable.) She had gumption, she never gave up, and while she might not always have behaved 100% appropriately, who among us has? At least she was honest about it. It's a little long but that's just right for a saga and it was a fast, easy read. Perfect for a long snowy day, or with all the images of ice cream, for reading by the pool or at the beach. I am so glad I read this book. I bought this book at Target. Nice review! I read this one a couple of years ago and I could see it being a good book discussion choice. I loved reading about Malka and the way she rose above her challenges and the creativity of the whole ice cream business. She was a tough cookie and not always likable but I definitely admired her determination!